Being able to swim increases confidence, and can become an enjoyable and healthy total fitness hobby. Whether it is to improve your stroke or start from scratch, Llanidloes Sports Centre Swim School is perfect for all. Here at Llanidloes Sports Centre we deliver the Swim Wales Aquatic Framework. This means your child will be following a nationally recognised syllabus and awards system produced by swimming’s governing body. It is our policy to ensure that all our lessons are enjoyable, interesting and above all we aim for the highest standards of water confidence, water skills and swimming techniques. Our Swimming Teachers follow continuous assessment which means swimmers progress at their own pace and move class once the assessment criteria has been achieved. Our swim school programme runs for 50 weeks of the year, during all school holidays with a 2 week break for Christmas. Baby starfish and swim club also break for easter holidays and summer holidays. 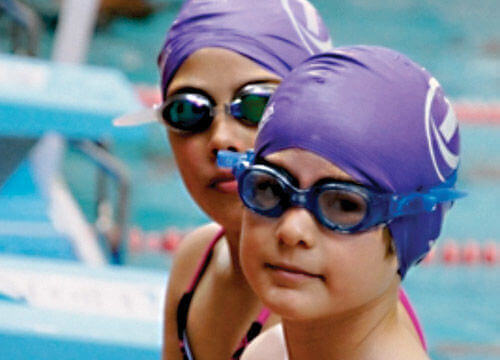 Swim hats are worn by all children in the scheme and are colour coded to identify the swim level. Hats are provided on joining the scheme and when progressing through levels. Replacement hats are available to purchase from reception. Don’t forget your child’s freedomleisure membership card entitles them to FREE swimming during all public swim sessions. This allows them to practice what they learn each week during lessons. Some levels take time to progress to the next level - swimming between lessons can help to speed up the process. Starfish direct debit membership can be cancelled giving 31 days written notice, prior to your next direct debit payment. Please complete the cancellation form, available at reception. If you have any further queries, please don’t hesitate to contact us.